In a city like Paris, a certain perception of its estates plays a significant role in one’s personal experience. Depending on whether the experience is based on nightlife, shopping, cultural tours or job/study opportunities, one’s perception determines one’s memory of a certain Parisian lifestyle. 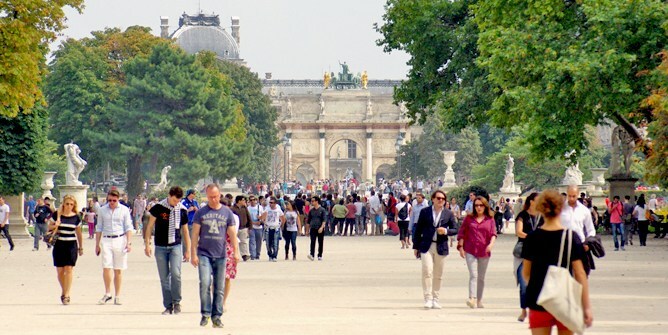 Although I like to deny it, my visits to Paris were those typical, expensive, tourist-like trips: shopping, partying, sometimes I would walk around a bit, but I’ve never found myself to be interested in discovering the city in depth. All I cared about was where to find a great bar or club or where the biggest stores are located. The best view hotels, divine French cuisine and a royal-like hotel suite. Although that did make my visits exclusively remarkable for a weekend trip, my memory, or perception in this case, of the city could easily be described in two simple sentences: “Paris is a beautiful city”, and “Paris is a great place to shop”. Yes, as simple as that. I guess from the way that I’m talking about the city, your first response sounds something similar to “wow, she’s a spoiled brat.”, and, as funny as it sounds, maybe sometimes I am, but up until starting university here, I haven’t had the desire to explore a different, real Paris. My Dérive started from the moment I moved into a rental apartment in a place that I thought I knew from top to bottom. It marked the start of a completely different lifestyle and there it was- the desire to explore the city’s different angles. I started doing something I had never done before in Paris: paying attention to my surroundings. This is my first time in Paris being all alone and the first time I looked at it not as a shopping or a weekend party location, but as an incredibly rich architectural city. I’ve been to a majority of artistically rich European cities; however, this is the first that opened my interest to architecture. Instead of calling an uber, I started walking to a particular address. Instead of scrolling Instagram while I walk, I placed my phone in my pocket. To some that might seem insignificant and unrelated to discovering a certain location, but as foolish as it sounds, initially, these actions changed my entire perception of the city. I started to observe various buildings and in particular their details. I examined how they are built, decorated, and what materials were used. I was surprised how interesting a building’s balcony appeared to be. The next thing I knew, I was attempting to recreate those details onto a piece of paper which I found very challenging. It was also my first time drawing any sort of building structures. As a matter of fact, this dérive of mine includes many “firsts”, which is why it made my discoveries and the overall exploration process interesting and motivating to proceed with. Maybe this dérive could’ve resembled something way more appealing than just the production of drawings on plain white paper; however, drawing, in particular, takes a significant part in my life. Using the skills I gained from multiple art classes motivated me to observe and research the details that had never come to mind before. The idea of illustrating what I saw, in this case, Paris architecture, resembled a personal study technique that took me on a certain passage of discovery. Starting from a pencil sketch of a door to being inspired by a certain detail, to recreating that certain detail and portraying it with my imagination is what led my way to discover a different side of Paris. I have to admit, I loved the luxurious hotel life during my weekend visits to the city, but the lifestyle that I have discovered while studying here for only two weeks has irretrievably twisted my perception of the city. There is still a lot to discover, but I think this is the beauty of Paris. It doesn’t matter how long you’ve been living here or what feelings have been resembled during past visits, this place is full of new opportunities and encounters. This is why I think that no matter how long I’ll be a citizen of Paris, there will always be something that will lead to a completely new discovery, triggering completely distinctive emotions.